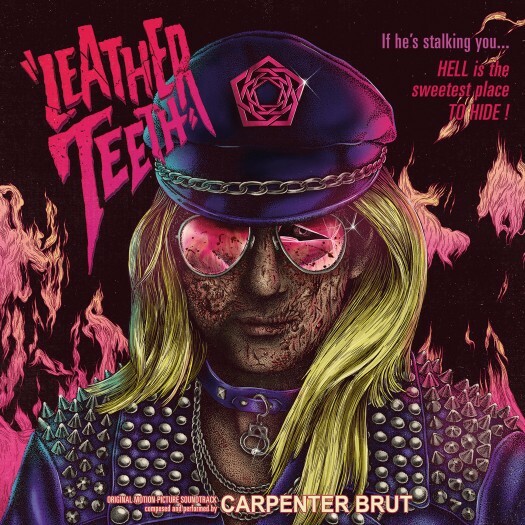 After a string of rapturously-received EP’s and a tour with Ghost that helped expose the synthwave sound to a wider audience, it was probably about time for Carpenter Brut to put out their first proper full-length. In true iconoclastic fashion, of course, they tossed Leather Teeth out into the world with almost no warning. And boy, have they incinerated any expectations. While the debut trilogy stayed pretty close to darksynth conventions, last year’s CarpenterBrutLive, forged from several US tours, showed more of a focus on a full-band sound and a cover of “Maniac” that served as harbingers of their new direction. The EP’s were a solo undertaking by Franck Hueso; Leather Teeth finds him embracing his newfound collaboration by unleashing a demonic disco extravaganza. In doing so, he succeeds where most synthwave artists fail: each of these eight songs has their own distinct identity, ironically creating more of a cohesive feel than if each track blended together. The title track skews the closest to previous efforts, with its hard-hitting beats, but after that it’s the Wild West. “Cheerleader Effect” features Ulver’s Kristoffer Rygg doing his best Tears For Fears impression. “Sunday Lunch” invites vaporwave over for waffles. “Monday Hunt” Perturbates furiously. “Inferno Galore” feels like the Blade Runner soundtrack performed by Goblin. “Beware the Beast” takes HIM to Miami. “Hairspray Hurricane” might be the most evil thing Jan Hammer never composed. “End Titles” ties it all back together seamlessly. Members of Hexvessel and Klone provided their voices, metal superproducer Jaime Gomez Arellano (Paradise Lost, Ghost, Primordial) helped record the vocals. In other words, this is a seriously impressive undertaking. Leather Teeth packs one fierce bite. Already one of the biggest names in the scene, they stake their claim here as not only some of the best songwriters, but some of the biggest innovators in synthwave. As other luminaries like Perturbator and Gost seek to distance themselves from that label, Carpenter Brut take the sound to an entirely new level.